Can't you just read his mind? "Mom! hey, mom! Look, it's a giraffe! Wow, that neck! Mom, you're missing it! Quit looking at dad!" In my defense, I had no idea he was coming that close. And just a few seconds later, we captured this one. He looks so annoyed that we conned him into looking away from that giraffe. Fun times at the Louisville Zoo! To read more about our visit, check out my post on our trip to the Red River Gorge. This post is a part of Photo Friday at Delicious Baby. Stop by to see other (probably not as silly) travel photos. I was also inspired by this photo contest that the Pioneer Woman has been hosting for the last week or so. While my photography skills are seriously lacking, you'll be blown away by some of these shots. Doesn't our little arrow look pretty relaxed? A good park and some sparkling blue water on a sunny day will do that to you. What are your favorite local parks? 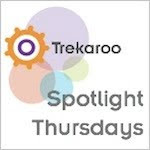 This post is part of Spotlight Thursday over at Trekaroo. Check it out to see what other families are up to this week! As much as I love to travel, when you live near a great, family-friendly city like Indianapolis, sometimes the travel moments come to you. Imagine my shock and pure joy when my little school, Butler University, survived the first four rounds of March Madness and made it to the Final Four! Hop on a plane and do whatever it takes to catch the games, right? Not when its in your hometown! That was our luck this past spring. 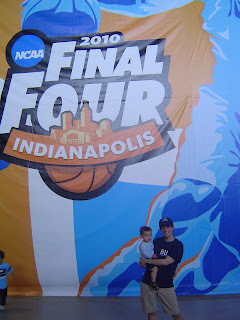 My husband and I splurged on tickets to the games that weekend (in which we came OH SO very close to winning a national championship!) but we wanted to find something to do with out little arrow so he could be a part of the festivities. We soon learned that the practice sessions for all four teams on Friday before the games were free and open to the public. So we headed downtown and joined 30,000+ of our closest friends (and mostly fellow Butler fans) to take in the action. 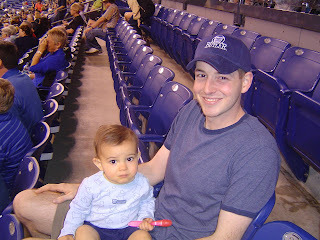 A preview of Butler Class of 2031, perhaps? Whenever you read an article or see a piece on America's national parks, the focus tends to be out west. Ok, I get it... snow-capped mountains, natural hot springs, ancient rock formations, yadda yadda yadda. We know. It's beautiful out there. What I've been lucky enough to see of it sends chills down my spine. But some of us reside on this side of the Mississippi. And you know what? This country really is gorgeous from sea to shining sea, and everything in between. Like the picture above, at the top of the Natural Bridge in Kentucky, found in the Daniel Boone National Forest. This sight gave me chills too, proving the West doesn't have a monopoly on breathtaking views. Want to see it for yourself? Head to Natural Bridge State Park. Its about an hour from Lexington, KY (and a beautiful drive). To get to this view, you can either hike up 2 miles or take the sky lift. There are several hiking trails to explore once you get to the top, also. Want to visit a national park near you? Check 'em all out here. This post is part of Photo Friday at Delicious Baby. Stop by to see other (more beautifully photographed) travel pictures. This morning and yesterday morning, while I was sweating my arse off on the treadmill, the Today Show was keeping me entertained with some great travel segments. Today (no pun intended) was all about car travel with kids. Some fabulous tips! My favorite was cookie sheets in the car--snack tray, drawing table, store easily and they are magnetic (Who knew?) Check it out. Yesterday, the focus was on chilly destinations. Not family-focused, but a few of these destinations seemed really kid-friendly (like the Lego water park... duh). And since we've been melting in 90+ degree heat nearly every day here in Indiana, I found this segment... aaah.... refreshing. You can find it here. I was particularly interested in the ice caves in New Mexico. I've been itching to cross that state off my list of places I've been, but have always assumed it would mean lots of hot days in the desert. Perhaps not! I'm obsessed with Anna Quindlen, author of a few books and former Newsweek columnist. I've subscribed to Newsweek for awhile, and Anna (we're on a first-name basis... in my mind) left the magazine quite some time ago, yet every week when it arrives, I still flip to the back, hoping she's there. Aaaah, alas, she never is. Someone posted this essay on Facebook today (I later found it on the blog I'm linking to here, and I believe its an excerpt from her book, Loud and Clear), and it had me in hysterics after the first paragraph. I didn't even realize who wrote it until I got to the end. I swear, this woman speaks directly to me. Maybe in my next life I'll write like that! The essay touched me so deeply. As a first-time mom, I know I struggle to balance being the relaxed, laid-back mom I want to be, and the control-freak, "hit every milestone" mom I sometimes am. I hope when our little arrow looks back on his childhood, he'll think that we "did more," not that we "got more done." Lord knows the cleanliness of my kitchen right now certainly reflects that philosophy. Afterall, just when I thought our little arrow would never crawl, he did! Well... our parents did it. Can't be that hard, right? We're planning a camping trip for a long weekend in September. I'm really excited about it--we've always loved to camp as a couple, and we both camped a lot with our families when we were little. It will be yet another milestone to tackle with our little arrow. Plus, we really want to instill a love of the outdoors in him... he already seems to have it, but I'm certain sleeping under the stars will cement it. But now that I'm a parent, I can't help but worry: Will he sleep? Will we bother all the other campers when he throws a fit? (Afterall, if you're anywhere for more than 5-6 hours with our kid, it is inevitable. As they say, it's when, not if.) What will we do all day if it rains? This article from the Travel Channel articulates some of my concerns. The comment saying that the hardest age for camping is when your child is crawling makes me think I might need a stiff drink once he's in bed each night. My saving grace is that I'm not a germ-o-phobe. Surely grass and dirt have some nutritional value. But where better to enjoy a gin and tonic than next to a crackling fire? 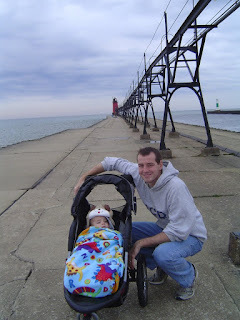 Between our family's first trip to South Haven, Michigan in November and April, the holidays came and went, our niece/cousin arrived, and we sold our house and moved an hour away. So needless to say, while we had a few hometown adventures throughout the winter, we didn't get to do much traveling in those months. By the time April rolled around, we were ready to resume traveling as a family. So we rented this cabin near the Natural Bridge State Park. It had two bedrooms, a full kitchen, two bathrooms, and a nice living/dining area. We loved the outdoor area--a beautiful deck and just down a gravel road from a beautiful rock formation. It also had a hot tub, which wasn't working when we visited, but we got $20 a night off our rental. The cabin was about a 3 hour drive from our house, so we broke up the ride with a stop at the Louisville Zoo. Its not the biggest or nicest zoo I've ever been to, but it had all the typical animals you'd expect and the size of the place was just about right for a 1-year old. His favorite (and our favorite) had to be the giraffes and the carousel, so don't miss those if you visit. When we arrived in Stanton, KY, the cabin rental staff gave us a list of nearby restaurants and attractions. Because this area is fairly remote, I had not been able to do much trip research in advance online. So their suggestions were helpful. We ate at a Mexican spot that first night and stopped at the grocery store to pick up picnic supplies for lunch the next day. That afternoon we headed into the state park. From there, we took a sky lift ride to the top of Natural Bridge, and then hiked to Balanced Rock. The views were amazing. Then the sky lift took us back down. If you have a really squirmy kid, I definitely suggest you secure them to yourself somehow before getting on the lift. Its very high off the ground. The park is free, but the lift has a reasonable charge. That night we had a great meal at Miguels, a local pizza joint that is a hot spot for mountain climbers. The Gorge is a great area for climbing, apparently. The license plates in the parking lot ranged from Texas to Ontario. So fun! We ended the night with a trip to the playground in the state park, and we were lucky enough to be able to watch the ducks go by. We wanted to explore the horse parks in Lexington on our way back home the last day, but it was pouring raining so we just drove straight back to Indiana. Another fabulous trip under our belts! Who goes to Michigan in November on vacation? That's the question everyone kept asking us as we embarked on our very first vacation as a family of three. The answer is a family looking for a quiet and affordable spot for a long weekend that wasn't too far of a drive. We rented a cottage on the grounds of The Victoria Resort, a B&B right off the beach. Our cottage had two bedrooms, one bath, a full kitchen and spacious living room. Renting a little place of our own instead of staying in one small hotel room is probably my top travel advice for families. It allowed us to have some time as adults once our son went to bed at night. Plus, because we traveled in the off-season, we were able to rent all that space for less than the cost of what a decent hotel would be anyway. 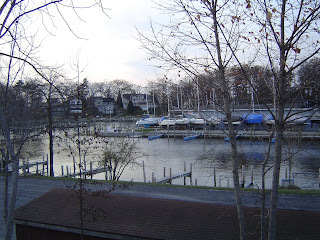 So what to do in South Haven in November? First, we broke up our drive with a stop at Notre Dame to walk around and enjoy the campus. I highly recommend that if you have to drive more than 3-4 hours with kids in tow, you find a great spot along the way to stop and let everyone get some fresh air. 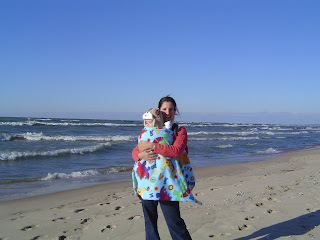 Once we arrived in South Haven, we got settled into our cottage, and then "hit the beach." Bikini, suntan lotion, and beach chair? More like fleece blanket, baby bjorn, and sweatshirt! But just as breathtaking for this typically land-locked midwestern mom! That night, we had an amazing dinner at Clementines, a South Haven staple. If you go, you MUST get the perch. It's heavenly. Clementines is great for kids--situated in a large, historic building right downtown. Plenty of big families gathered together, very casual, and just enough noise to mute any fussing that might occur. The next day, we walked the long pier, hit up the shops in town, and settled in for a nice long nap that afternoon. Later, we found a great park just a few blocks from our cottage, which had beautiful views of the marina. That night, we ate at a local Mexican spot to finish out the day. There is plenty more to see and do in South Haven, regardless of season. The staff at the Victoria Resort was so helpful in making recommendations. Their website includes plenty of suggestions for activities to please just about anyone. My husband and I were pretty seasoned travelers before we had our son. 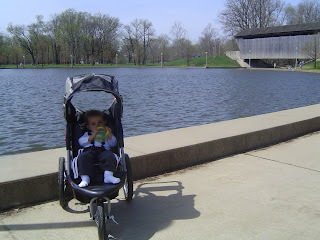 By the time he was six months old, we were itching to tackle our first adventure and see what kind of little traveler we had produced. As you can see, we kept our first trip pretty simple, made sure he took naps each day, ate at his usual times, etc. We were so pleasantly surprised with how well he did, and this first success led to more adventures down the road. So it will always remain a favorite time in our lives as a family.